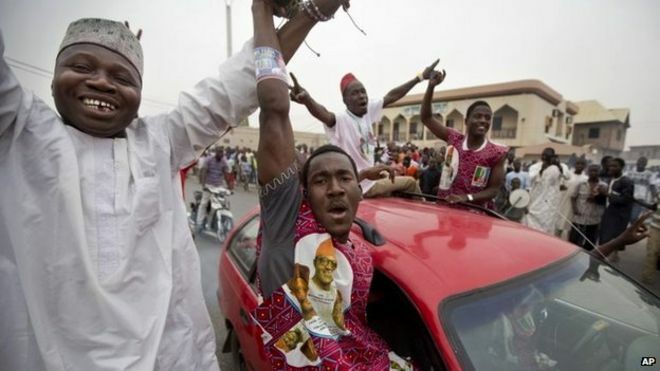 The winner of Nigeria's presidential poll, Muhammadu Buhari, has hailed his victory as a vote for change and proof the nation has embraced democracy. Mr Buhari also praised outgoing President Goodluck Jonathan as a "worthy opponent" who peacefully relinquished power. Gen Buhari beat Mr Jonathan by 15.4 million votes to 13.3 million. Mr Buhari, of the All Progressives Congress (APC) party, has become the first opposition candidate to win a presidential election in Nigeria. The former military ruler said: "President Jonathan was a worthy opponent and I extend the hand of fellowship to him. "We have proven to the world that we are people who have embraced democracy. We have put the one-party state behind us."